UPDATED: Sat., Feb. 23, 2019, 11:41 p.m. Hearts are always full for the goodbyes of Senior Nights across America, no matter the sport or the site. At Gonzaga, that’s even more the case, at least now that the Bulldogs have re-established the concept of, you know, winning the game. The honorees make their entrance through the Kennel Club, enjoy a hug with their families and say a few words over the microphone at game’s end. And room is always made in the starting lineup for any end-of-the-bench walk-on moving on at season’s end. He may never see action in the middle of the game, but he’s often there at the end – and this one time, in the beginning. But the Zags may never have done it better than they did on Saturday night, in the fullness of their dominion over the West Coast Conference. Oh, there have been home finale blowouts before, but the 102-68 knockout of Brigham Young had it all for the in-house witnesses: an opponent both of consequence and yet roundly contemned, a little payback for spoiling a couple of other Senior Nights, some boiling over on the visitors’ bench. But most of all, the Zags were at their best. It’s a good thing the marketing folks have the whole off-season to resplice the highlight reel. All in all, a perfect sendoff for Josh Perkins, Jeremy Jones, Geno Crandall and Jack Beach. And probably for Rui Hachimura and maybe Brandon Clarke and, well, who knows who else for sure? This is the only problem with Senior Night. It’s kind of a 20th-century concept for college basketball’s upper crust. Tiptoe through the Top 25 and it’s the rare school that doesn’t have a player who won’t revel in one of these unconditional lovegrams because of a career decision to take their shot at the NBA after his junior year, or before. Is it time for Junior-Senior Night? Just think of the Zags who missed out on the big farewell – Adam Morrison, Austin Daye, Kelly Olynyk, Domantas Sabonis, Nigel Williams-Goss, Zach Collins. That’d be a pretty good team to take into the NCAA bracket. 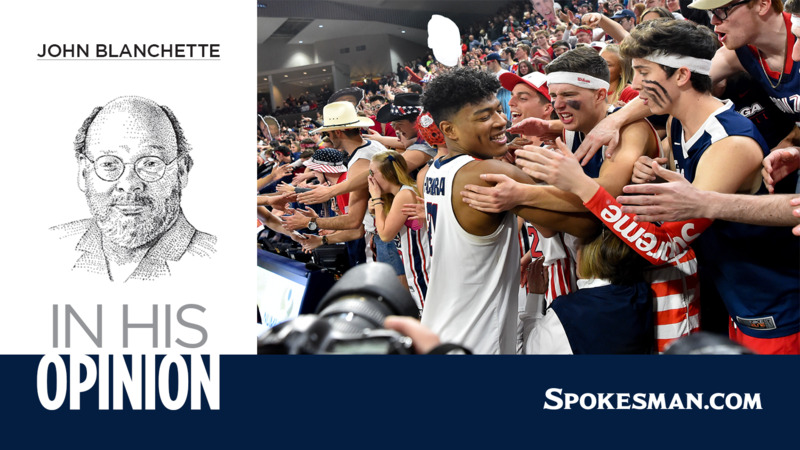 And for the Gonzaga fan who enjoys his angst as much as his alley oops, that’s been the mostly unspoken undercurrent to the ongoing sensation of the 2019 season: how many of his underclass favorites will need replacing, too? Maybe a lot. Maybe more than ever. Hachimura and Clarke are prominent on many of the NBA mock drafts you can find all over the hoopscape. Killian Tillie’s name has also been found on several, though his injury issues have certainly complicated his immediate future. Zach Norvell Jr. hasn’t seen that much run, but he could conceivably explore his worth. But there’s an upside, too. The Zags have become really good at figuring out the whole roster-churn game. Already the Bulldogs have in the barn one of their largest and best regarded recruiting classes – five players, all at one time among the top 100 in ratings compiled by 247Sports.com. One of them, 6-foot-10 Pavel Zakharov, a Russian playing at Monteverde Academy in Florida, was in the Kennel to check out the fun on Saturday night. And just before tipoff came the word that 6-10 Oumar Ballo, a strapping 16-year-old from Mali, had made his commitment to GU after attending Thursday’s win over Pepperdine and plans on enrolling this summer. There’s a lot of big in the group – and a lot of young. And no obvious replacement for Perkins at the point in the pipeline yet. But, really, how much do you really want to sweat next year while you’re watching such a special season unfold, and in the glow of an evening like the one the Zags had Saturday? They might also suggest this wasn’t necessarily the end. Might be the only way to top the one on Saturday night. Published: Feb. 23, 2019, 11:29 p.m. Updated: Feb. 23, 2019, 11:41 p.m.